Photorealism Inside a Virtual World? Mix your worlds– this is from an event today we held in Second Life (114 people showed up in this place where "no one is ever around") — a demo of a Virtual Reality Room. This is a clever implementation of a Cubic Panoramic photo format, the basic construct of a QuickTime VR scene, and you can wrap it in a giant space inside Second Life. So here is our group of 40 some folks — this is a photograph from inside of Second Life (this was the second demo) perched like little toys on the round platform, completely enveloped by this scene of Anish Kapoor’s Cloud Gate sculpture in Chicago, or the "big shiny bean". You can move around or move your view around and explore an amazing amount of rich detail. it is quite different from your stereotypical SL rendered scene. This was even more impressive as I was at this spot just last August for the SLCC conference. 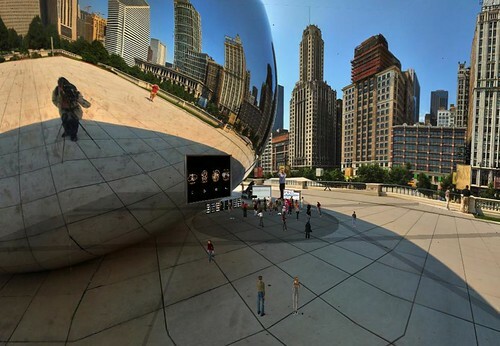 And there right in the reflection of the big bean is the photographer, doing the series of wide angle lens shots using a special tripod head. I got nostalgic for the days of doing my first QTVRs in the mid 1990s, though mine never looked this good. Real Reality inside Virtual Reality? Oh the recursion! So yes, in my role at the NMC we are involved with Second Life in a big (blogging too) way, and looking back over to where education and Sl were at, it has come a long way, in terms of many more educators being activ, and perhaps not so far, as many of us are still sorting out what we can do in this place. I for one dont see it as an all encompassing magic bullet, and certainly will not be as encompassing as a platform a the web is, but my gut says there is still some there there. And again, our efforts here are less in advocating SL as the platform, and more into using it as a laboratory to investigate what kind of activities we could create, support there. And it has me thinking to a bit of the end of conversation I tapped into yesterday for the Future of Learning in a Networked World 2008 discussion (it has no bearing that this conversation happened in Second Life??). One of this groups popular topic points is debating/discussion differences between “groups”, “networks”, “communities”. I find the conversation interesting, and they do provoke some deeper thinking as to what they mean in this new electronic spaces, but, as I admitted, I am not all that invested in trying to concretely define them– I know I have a giant cloud of people, places, things that might be considered any one or all 3 of those nouns, but does it matter what I call it? Our NMC Teachers Buzz sessions has been a wonderful mode to connect -maybe it is a group? But we started this in August 2006 intended to be regular, mostly informal meetups in SL to talk about education in SL, more like a conversation at a coffee house than a lecture hall. The best part is when we put out an invite or request to this group/network.community, we get a substantial response, and our meetups constantly have a flux of familiar and new avatar faces. Its similar to the good feeling you get on twitter when you put a call out, and people respond. And running some full conferences in Second Life has also been a fascinating experience and is giving lots of thoughts as to what we can do when we convene professionally in a place other than a stale ballroom of a large urban hotel. So to me, Second Life is not much about the cool buildings and dance clubs and furry animals (hey! ), but really, it is the rich social interchange that is there, a a level I perhaps do not get in other e-spaces. And in this year, because our initiative at NMC is in virtual worlds, not Second Life, some big things are on the horizon. Alan: I’m sorry I wasn’t able to join the crowd for the demo. I’ve been a peripheral member of NMC but appreciate getting the announcements and invitations. My own interests lie more in corporate / organizational areas than in academic ones (though there’s obviously overlap). It’s valuable to see the social interchange in action, as well as demos like the one of a virtual emergency room I saw a while back. Got any suggestions for finding more people / efforts / areas related to training (as in more structured) and learning (as in less so)? You know, I remember seeing insides Stephane’s VR box for the first time – in fact, I think it’s a photo of me you’re quite familiar with. He’s a lovely guy – one of my first friends in Second Life – and what he’s done with that device is quite brilliant. Hi Kisa ! Long time no see, drop by a the chess club some time ! I don’t have as much experience with SL events as you do, but I agree that in some terms the richness of the experience exceeds other online conferences (of course, most of those are mostly asynchronous)… but if richness is a spectrum, then I would bunch SL and other async conferences down together at the low end, with face-to-face conferences way on the other end towards the positive… when it comes to the social aspect. Now, for the presentations– most of those are so bad (poor presenters, death by powerpoint, etc) that I can imagine, but rarely experience, a better SL alternative. Am I A Blogger Domain Squatter? Is that Bad?